Don't you want your name on this? Young gamers growing up in the early 90s no doubt remember Worlds of Power. It was a series of youth-oriented novelisations of classic NES games...and the books have become legendarily awful. They were inaccurate, inept, and very poorly written. While their ostensible mission was to interest children in the magic of reading, I'd be willing to bet that all they did was convince them of the superiority of video games. As works of unintentional comedy, however, they can't be beat. That's why I'm spearheading a one-off fiction anthology called The Lost Worlds of Power. The idea is that budding authors, humourists, gamers and whomever else can write their own "lost" literary adaptation of any game that was available for the NES, and submit it for inclusion in the anthology. You can make your story funny, you can make it dramatic, you can make it winkingly terrible, or you can use the characters or setting as a jumping-off point to write something almost completely unrelated to the game. The possibilities are endless, and the more submissions I get the better the anthology will be! 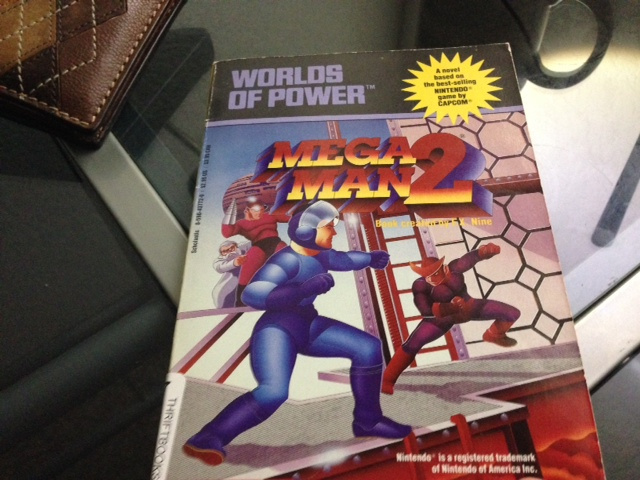 For those of you who haven't had first-hand experience with Worlds of Power, you can bring yourself up to speed with my reviews of the novelised Castlevania II: Simon's Quest and Mega Man 2. Be warned, however: they're every bit as terrible as their reputations would suggest. You can read more about the project, including additional rules and guidelines, here. I'd also be happy to answer any questions you may have about it, so get in touch! There are no length or content restrictions, and the deadline for submission is January 31, 2014. You can submit as many stories as you like, and there is no charge for submission. The final volume will be available for free download and distribution in ebook format, and it will make a great publishing credit for any up and coming writers out there. If you don't write, tell your friends who do! Finally, I'd like to make one thing very clear: The Lost Worlds of Power is not affiliated with Nintendo Life in any capacity. This is my own project, which is why I'm writing this news item in the first person. It was my own idea and my own doing, so remember, I'm the one to blame for bringing the series back to life...not Nintendo Life! I'm on board. Working on S.C.A.T., currently. Maybe do something like Legacy of the Wizard or The Guardian Legend next, if time allows. If nobody else tries Contra, though, it'll be hard to resist... I seriously want to do a graphic novelization. Can't wait to see how it comes together! Ah dude this is cool! I definitely want to try and take a part in this! Yeah! ...need to get working on mine again, I haven't touched it for a few days! There's an article about The Project now? Things are getting serious. I probably should as well! This is something I'd be interested in. I always like to try and flex the old creativity muscle. However, I will need to find a good game to adapt. Oh, gods. This is exactly the kind of thing I'd put on my resume for agents and editors... I could write something terrible for The Legend of Zelda if that's not, like, by default already taken. If not then IT'S MINE! There is a Road Rash book that came free with Sega Power that I thought was pretty good. (About the same time as these). Not read it since so it might be awful. If you want to write something like Finnigans Wake then Milon's Secret Castle would be the one to choose. Done. I'll submit one for Secret Ties. That one's a TRULY "Lost World Of Power", considering the game was never released! It wouldn't surprise me if the Worlds Of Power writers made books for games that never released. I had like half of them growing up and they're not as bad as people make them out to be if you don't go expecting accuracy and 'artistic license.' In a way they're like rubber monster movies, so bad they're good. I will have a go in my spare time. I won't put too much effort in - I want to be true to the originals! Thanks for the support, everyone! It's so exciting to see the idea gaining traction like this. Let's make this awesome! And @Phantom_R , you're in luck...nobody's mentioned The Legend of Zelda to me yet. Go for it! @DestinyMan As of right now Super Mario Bros. 3 is fair game. I say go for it! And it doesn't have to be terrible at all. Writing a deliberately crappy adaptation is definitely one way you can go...but if you think you can turn SMB3 into a profound, moving masterpiece, then by all means do that! Who is doing Yoshi's cookie? I'll have a look and see if there is one I feel like doing. Also is there a limit of one story per game, or could there be several SMB stories between several authors? @Philip_J_Reed Are you allowing entries of Japan only Famicom games? MAN this sounds awesome! I'm gonna write something about some game, just gotta figure out which one isn't already taken & I have an interest in writing about. I might do Metal Storm. You are kidding! NES Only! So many awful Sonic stories will never be written because of this! On second thought, its probably good that it is NES only. @Philip_J_Reed Can we have an offical current list of what has been taken? I call BATMAN, the Official game, I could write TWO novels on that one....yes indeed, I WANT IN! I have never done anything like this but Im really inspired! it will be an easy read with a serious overtone, but due to my inexperience it will probably sound like a cheesy action movie at times. Nanowrimo is coming in November. If you can just roll it into that, then all will be well. Of course, there'll be editing session as well, so January deadline, right? @Knuckles Read the rules that are linked in the article. Any NES game? Like Pinball, for instance? That would take a lot of imagination for sure. Would the ball be the protagonist? Or the player? @Knuckles There's no official list of what's been taken and what hasn't, because I wouldn't want someone to "reserve" a game and then not actually write their piece. So by all means, go with whatever you think you can do best! @BlackStar9000 I was definitely hoping somebody would do a licensed game. So much potential there! @ramstrong Indeed! In fact, that's exactly what a friend and I are doing. It's good timing (I hope!) for anyone who wanted to do NaNo but didn't have any ideas...and it should still leave enough room in December and January if they'd like to do this, but write something else for NaNo. I didn't want to step on any toes. @Zaphod_Beeblebrox A friend of mine is doing Marble Madness, and there was an actual Bases Loaded Worlds of Power book...in both cases it would take a lot of imagination to assign a story to those, so Pinball isn't out of the question at all. In fact, I hope somebody does do one of those truly "blank slate" games. It should be a lot of fun. I will probably try King's Knight, or maybe Tetris.